In anticipation of the reopening of the Japanese Garden this June, Lotusland has mounted an exhilarating group show that includes some of the world’s top origami artists, with many of the works responding in some way to the adjacent gardens. Perhaps the most striking example is a bright-red cycad seed cone folded by Robert Salazar out of a single uncut hexagon of Thai unryu foil paper. Anyone who has visited the cycad garden will surely remember these eye-popping ornamental plants. The fact that Salazar was able to “sketch” such a beautiful and complex natural object in three dimensions simply by folding reflects a mind-boggling sophistication that is much in evidence throughout not only his work but also the entire show. 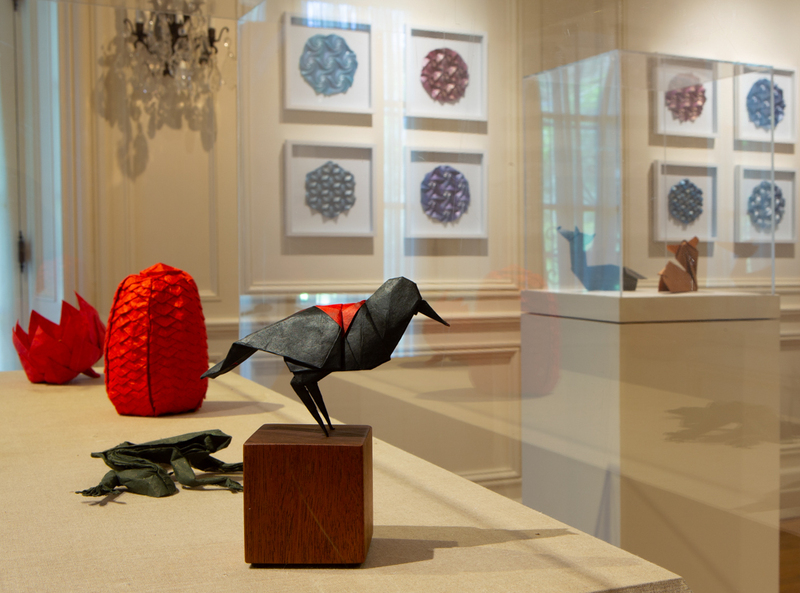 For example, Robert Lang, a giant in the origami world, has provided multiple works, including a flock of remarkable birds that look as if they could fit right in with the live ones perched in Madame Walska’s trees. Curators Meher McArthur and Holly Sherwin have done an impressive job of gathering outstanding work from relative newcomers as well. Mychal Arata, a Ventura artist who made a colorful origami dress out of used paper tablecloths, told me that showing alongside origami stars like Lang and Linda Tomoko Mihara was “the equivalent of a garage band that gets to open for the Rolling Stones.” To appreciate the amazing skills of these folded-paper rock stars, book a garden tour of Lotusland. Admission to this charming exhibit is included, and who knows, maybe while on the tour you’ll spot a cactus you’d like to “sketch” with a sheet of green paper. Lotusland in Origami: Flora, Fauna, and Ganna is on view at the Lotusland Pavilion Gallery through May 18.